The Basic Operational Training Unit (BOTU) formed at Coast Guard Air Station Savannah, Georgia, to provide standardized pilot/aircrew training for the HH-52, had been an unqualified success and Coast Guard Headquarters wished to extend the program to other aircraft. Air station Savannah was located on Hunter Air Force Base. The facility was being transferred to the Army to be used as a helicopter flight training facility. Due to the increased helicopter training requirements, directly related to the Vietnam conflict, the availability of space to accommodate a Coast Guard expansion at Savannah was problematical. A search was undertaken to find a suitable location for an expanded training unit. An Air Force Reserve facility, in care-taker status, was located on the north side of the municipal airport at Mobile Alabama. The facility consisted of a large main hangar, an Administration Building, and a Public Works Building on 232 acres. During this same period the Air Force planned to eliminate flight operations at Keesler AFB. This was the location of Coast Guard Air Station Biloxi, charged with fixed-wing Air Search and Rescue resources for the Gulf of Mexico from Cape San Blas, Florida to Sabine Pass, Texas. The Air Station had to be relocated. A feasibility study with options, funds required, and time-phasing for accomplishment was prepared and approved. The proposed facility would accommodate the current training requirements, support a relocated Biloxi Air Station with its search and rescue responsibilities, and had room for expansion. The Commandant approached the Chief of Staff of the Air Force with a request that the facility be transferred to the Coast Guard. The Air Force was receptive to this and on 17 December 1966, Air Station Mobile was officially commissioned with the transfer of HU-16E aircraft from Air Station Biloxi and the establishment of the fixed-wing and rotary-wing pilot training units. The Air Station had a Training Division and a SAR Division. 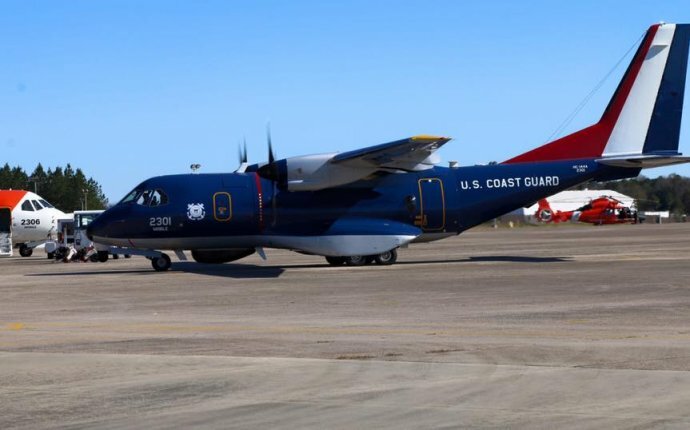 The SAR Division provided fixed-wing support and was under the operational control of the Eight Coast Guard District for all non-training missions. The HU-16E aircraft were placed in a pool which supported both the SAR and Training Divisions. The primary mission of the Training Division was to transition newly designated aviators to the HU-16E and HH-52A respectively and then send them to their units as designated co-pilots. Additionally fixed wing aviators were transitioned to helicopters (HH-52A) and helicopter pilots were taught to fly fixed wing aircraft. (HU-16E). Instructors were sent to operational units at varying times to conduct standardization flights for unit aviators. During the summer months the HU-16E training section conducted the Cadet Aviation Training Program for CG Academy Cadets. In 1967 the HH-3F began entering the Coast Guard inventory and a HH-3F training section was established at Mobile. A year later an Icebreaker Support Section was established. Expanded messing facilities and a Barracks/BOQ complex was constructed. In July 1969 Air Station Mobile was renamed the United States Coast Guard Aviation Training Center and was designated a headquarters unit. This placed the training center under the direct control of the Commandant, a move necessary to facilitate and coordinate the movement of several hundred pilots in and out of Mobile each year. A study of Coast Guard aviator training requirements was also commenced in 1969. The study included a detailed analysis of costs and procedures. It was determined that a revised training program taking advantage of new concepts and technology could increase training effectiveness while simultaneously reducing costs. This was the starting point. It lead to the first full motion simulators in the country and revolutionized Coast Guard flight training. The Coast Guard became the first military service to authorize instrument ratings strictly on simulator time. At present the unit is named the Aviation Training Center, which better reflects its present functions. The unit provides qualified aircrews and standardization for HU-25, HH-65, and HH-60 operations and additionally provides standardization training and certification for Coast Guard ship/helicopter operations. The unit maintains an operational commitment to provide aviation support for Coast Guard Eighth District search and rescue, law enforcement, marine safety, homeland security, and logistics missions. This is accomplished with an around-the-clock ready HU-25 and other available aviation assets. With well over 400 active duty military, civilian and contract personnel, and a payroll of over 17 million dollars, the Aviation Training Center is one of the larger air units in the Coast Guard and is one of the largest non-industrial employers in the Mobile area. As of 2000, more than ever, each of the eight divisions of the Aviation Training Center - Operations, Training, Polar Operations, Aviation Engineering, Health and Human Services, Comptroller, Services, and Facilities Engineering - work together to support Coast Guard missions worldwide. HU-25A "Guardian" aircraft stand alert duty in support of Eighth Coast Guard District missions such as Search and Rescue and Enforcement of Maritime Laws and Treaties. HH-65As from the Polar Operations Division deploy on Coast Guard icebreakers to the ends of the earth, where they fly scientific, logistic and, occasionally, SAR missions. The Training Division provides initial and recurrent training to all Coast Guard HU-25A, HH-65A and HH-60J pilots. Each Coast Guard jet and helicopter pilot receives an initial transition into Coast Guard aircraft and an annual week of intensive refresher training in one of the three flight simulators located at Mobile. With over 500 active duty military, civilian, and Coast Guard Exchange System (CGES) personnel, and a payroll of over 17 million dollars, the Aviation Training Center is the largest air unit in the Coast Guard and is one of the larger non-industrial employers in the Mobile area.